Our personnel and facilities are immediately available 24 hours a day, every day of the year. However, our office is only staffed during the following times or by special appointment. From Peterborough, Milford, or the seacoast – Travel west on New Hampshire Route 101 to the intersection of Route 202 (U.S. Highway 202). Turn left (south) onto Route 202 and follow it approximately 6 miles into Jaffrey. Proceed to the first traffic signal and turn right. Remain on Route 202, and continue to the second traffic signal, and turn left. Follow Route 202 to the funeral home, which is located on the left (south) side of the street, just past the Vietnam War Memorial. Parking is located at the rear of the funeral home. From Massachusetts (Boston) - Travel Massachusetts Route 2 west to Exit 24b, MA-140 (north to Ashburnham/Winchendon). Exit north onto MA-140 and proceed to its end, at the intersection with Route 12. Continue straight through the traffic signal onto Route 12. Travel approximately 1 mile to the first paved road on the right. The road is marked with signs to the Massachusetts State Veterans Cemetery. Turn right (north) onto this road and proceed past the Veterans Cemetery. This road becomes Route 202 (U.S. Highway 202). Proceed into Rindge, New Hampshire. 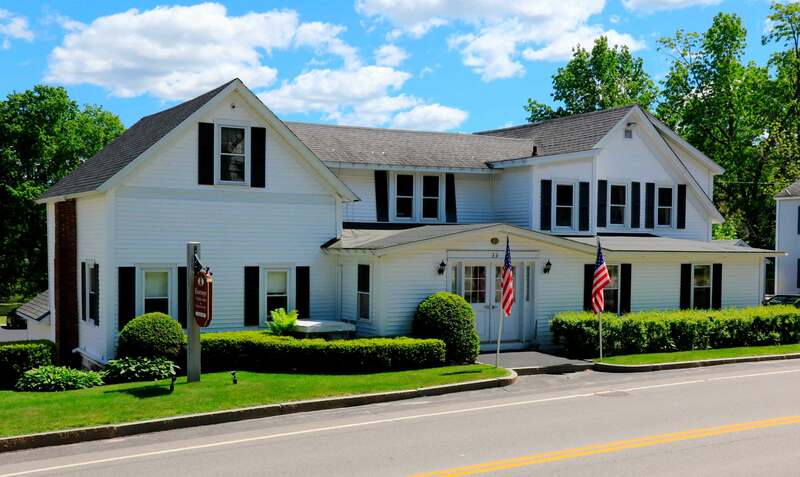 Continue north on Route 202 through three traffic signals into Jaffrey and proceed to the funeral home, which is located on Route 202 directly across from School Street, on the right (south) side of the street. Parking is located at the rear of the funeral home. From Keene or Vermont – Travel New Hampshire Route 101 into Marlborough. At the end of Main Street, New Hampshire Route 124 will be on the right. Turn right onto Route 124 and continue over Mt. Monadnock into Jaffrey. Turn right (south) at the first traffic signal onto Route 202 (U.S. Highway 202/River Street) and continue to the funeral home, which is located on the left (south) side of the street, just past the Vietnam War Memorial. Parking is located at the rear of the funeral home.